With Groupon Payments, Groupon hopes to reassure shareholders that have been disappointment by the company’s performance since its initial IPO price at $20 per share tanked and settled into single digits. At the moment, based on Yahoo Finance, Groupon’s stock is priced at $5.31. Still, that number is up since September, when it was at its lowest at $4.15 per share. According to Groupon’s blog post, Breadcrumb’s General Manager Seth Harris explains that the company will be purposed with the hospitality industry in mind. “We started Breadcrumb to provide the hospitality industry with the best POS experience it has ever had,” says Harris. Breadcrumb is a fairly robust point-of-sale system: Servers can search for menu items and rearrange tables within the iPad-based software, take and place orders, split checks, process payments, and access analytics to track sales and performance. Breadcrumb for Groupon will run strictly on iPads for a recurring monthly rental fee of $99, and this cost includes 24/7 support from Groupon’s hospitality focused customer service representatives. Breadcrumb will likely have multiple payment plans depending on the number of terminals that a business is interested in renting. All plans include the iPad compatible Breadcrumb software for rent, unlimited users, and free updates. 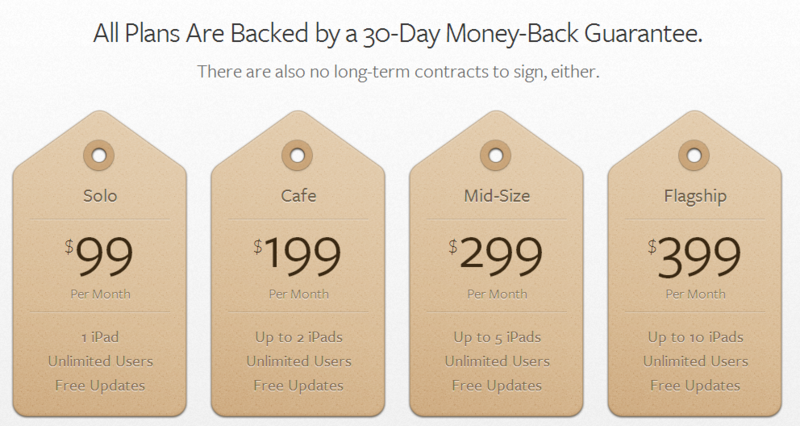 But for $399 per month, merchants can use Breadcrumb on as many as 10 iPads, according to Breadcrumb’s site. Although, for that cost, the hardware (iPads, printers, and cash drawers) isn’t included. Groupon Payments will likely serve as the payment system running on top of Breadcrumb’s platform. We’ve reached out to Groupon to clarify this. When we last talked to Groupon, we learned exclusively that the company is working on developing a brick-and-mortar point-of-sale terminal for local mom-and-pop type shops, which should be introduced within the next month. According to a Groupon rep, not all small retail owners are tech savvy and interested in evolving into iPad POS services. With Groupon’s stock price slowly climbing, the company may have found a way to crawl out of the daily deals black hole.